The carriage of the badminton robot Jada is secured in the end positions by means of industrial shock absorbers of the MAGNUM series. High energy absorption, continuous outer thread, state-of-the-art sealing technology, hardened guide bearing and integrated fixed stopper: The MAGNUM absorbers of the MC series. The badminton racquet and the hand that can turn through two axes move horizontally backwards and forwards on the carriage. The axes determine the hitting strength and the direction and are equipped with small shock absorbers and TUBUS profile dampers. FMTC, an independent research centre that is available to help non-profit Belgian institutions with new projects, recently presented a highly interesting mechatronic demonstration object: a badminton robot that acts as a useful prototype for testing new technologies and concepts. It can compete with human opponents in a game of badminton. Various damping elements from ACE Stoßdämpfer ensure the safety of its three mobile axes. 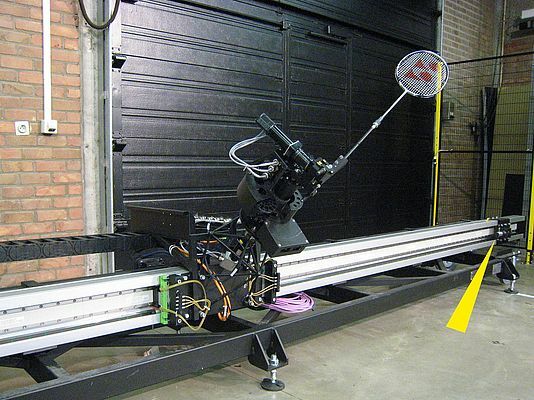 This badminton robot called Jada that was developed in Belgium accelerates at triple the earth's velocity making it faster than a Formula 1 racing car. Two cameras act as eyes, three computers as its brain to control the hand-eye coordination and three motors as its muscles. "Being able to move freely on three axes and work so precisely means that it is almost impossible for Jada to make mistakes", explains Joe De Waele, business development manager of the company Flanders' Mechatronics Technology Centre, aka FMTC. This is where the robot was developed to demonstrate what the engineers from the independent Belgium research centre in Leuven are capable of. Not only the products are innovative, their positioning is unique too. It acts as an interface between scientific research centres at universities, colleges and industrial operations. The objective is to create competitive advantages for the members by means of innovative technologies. To profit from these advantages in the long term, the engineers need to ensure that their designs are as safe as possible. In this special case it was important to ensure that the arm holding the racquet moved on a carriage along the horizontal main axis. Due to the fact that the carriage weighs 50 kg and is accelerated up to 3 m/s very quickly, failure of the control system responsible for braking would cause a crash that could completely destroy the system. To ensure that the badminton robot is able to play, it must be capable of changing direction very quickly. Jada is therefore designed to brake with a maximum force of 30 m/s². This stopping speed is more than three times the earth's velocity. In comparison: these braking forces are more extreme than fast rollercoasters or some Formula 1 racers. The forces are much higher during uncontrollable failures; the requirements made of the emergency stoppers are enormous. In light of this, a decision was made in favour of the industrial shock absorber of the type MC4575M-0 from ACE Stoßdämpfer. The machine elements that work with state-of-the-art damping technology are able to gently absorb and brake the kinetic energy of the heavy carriage over a minimal distance of 75 mm without allowing the stop positions of the design to be damaged. This is ensured thanks to a maximum permitted power absorption of 1,020 Nm per stroke. The self-setting and maintenance-free dampers stand out thanks to their compact size which makes them easy to install in existing constructions. The badminton racquet is attached to a hand that can turn through two axes and move horizontally backwards and forwards on the above-mentioned carriage. These axes determine the hitting strength and the direction. The designers named the first axis the "hitting axe" and the second one the "rotating axe". 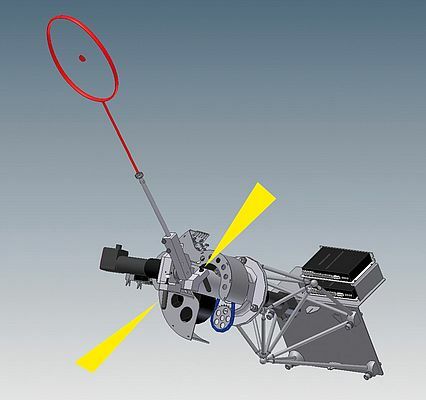 Small shock absorbers are fitted in the "hitting axe" and TUBUS profile dampers from ACE are fitted in the "rotating axe". The technology of the small shock absorbers is the same as that in the industrial shock absorbers on the main axis. As the name suggests, they are designed for much smaller forces, namely 20 Nm. That is less than 2 percent of the values that the above-mentioned fitted industrial shock absorbers can cope with. However the braking output of these small shock absorbers is fully adequate at this part of the badminton robot. 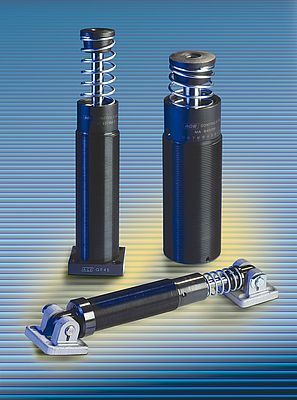 Also, the profile dampers of the TUBUS series made of co-polyester elastomers can be integrated as a cheaper alternative to the shock absorbers wherever precise stopping is not specified. In this case, the deciding factor was their shorter installation length compared to the small industrial shock absorbers. Whilst up until now Jada has always played from the baseline, it will soon be able to move more freely across the field owing to a magnetic field. Based on the innovative ideas implemented by FMTC and ACE to date, a coherent concept using adequate braking and damping elements can be expected soon to meet this requirement.